Samsung is reporting that 5 million Galaxy S II handsets have been sold globally, only 85 days after its initial launch and 40 days faster than its predecessor, the Galaxy S. This contradicts what we heard late last week, when Digital Versus reported that apparently 6 million units had been sold in "less than three weeks", however, this recent announcement from Samsung suggests that those figures may have been exaggerated. Samsung's flagship Android smartphone has already acquired over 56% of the mobile market in Korea and has also topped the market share of 10 European countries, including the UK, France, Germany, Italy and Spain. Keep in mind that this is all without an official US launch, which is expected in the coming months. It appears that the original press release (in Korean and translated) is from the SamsungTomorrow Flickr account alongside some unusual graphics. 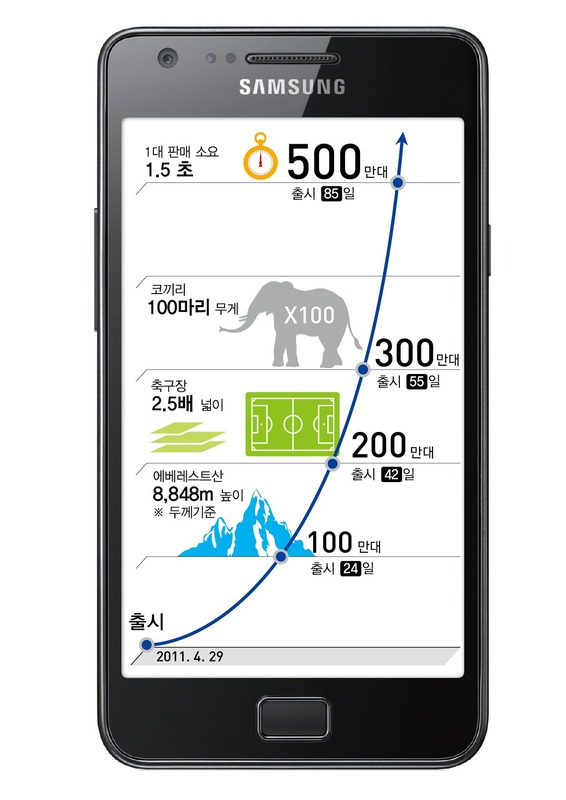 Interestingly, the announcement states that the Galaxy S II has "passed the turning point of 10 million global sales". We believe that this is a poor translation of the Korean headline and it actually means that the device has passed the halfway mark (that is 5 million sales) on its way to a goal of 10 million sales. Galaxy S 2, which is becoming a global smart icon, finally passed the turning point of 10 million global sales. Samsung Electronics announced on July 27 that its flagship smartphone Galaxy S 2 has marked the accumulated global sales of 5 million units only 85 days (on July 22) after its release. 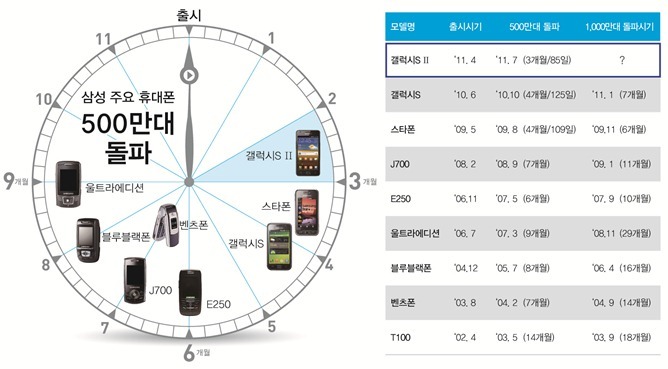 Galaxy S 2 reached the turning point 40 days earlier than its predecessor: Galaxy S did it in 125 days. Galaxy S 2 acquired 56% of the entire mobile phone market in Korea last month, and it has topped the mobile phone market share in more than 10 European countries, including the UK, France, Germany, Italy and Spain. And it seems Galaxy S 2 is ‘still hungry’ as it is now poised to spread its global sensation into other regions like Latin America and China.